For over 60 years, the Grumman S2F – later designated S-2 – has remained a major fixture in Western anti-submarine arsenals. Now “Stoofs” get Ginter treatment in the first volume of a two-part history: Grumman S2F/S-2 Tracker: Development, Testing, Variants, and Foreign Users – number 101 in the publisher’s “Naval Fighters” series. After a brief background on anti-submarine warfare during World War II, text quickly segues to single- and twin-engine OS-117 proposal studies – origin of the Tracker. Grumman’s winning Design 89 featured high aspect-ratio wings, excellent visibility, internal bomb bay, retractable search radar and novel, nacelle-mounted sonobuoy dispensers. Suitable for carrier- and land-based operations, the compact S2F/S-2 Tracker effectively combined, authors Robert J Kowalski and Tommy H Thomason observe, the roles of hunter and killer. And “Stoofs” remained in widespread international service since the 1950s. Spanning 204 pithy pages, Ginter’s lavishly illustrated study details design, development, testing, deployment, variants and proposals. Just wait ’til you see “Julie” system’s namesake! Text traverses – among other things – power plants, armament, cockpit, landing gear and electrical systems. And dozens of photos, tech-manual excerpts and drawings deftly delineate specifics – inside and out. Want to know where the “diesel sniffer” was? Or exact, official S-2 dimensions? They’re here. Sidebars, extended captions, tables, charts and performance data also augment the account. 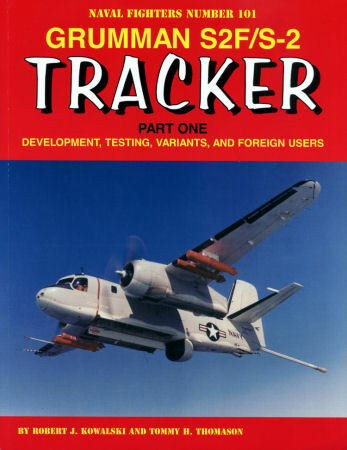 Trackers have appeared as a scale model subjects since the early 1950s. And as usual, Ginter conveniently covers all known offerings – injection-molded, vacuum-formed and resin – in a section of helpful kit and conversion reviews. Just one quibble: that Collect-Aire build-up on page 169 wears Venezuelan – not Argentine – markings. The Tracker, authors note, “was a brilliant design as evidenced by its longevity and usefulness in a variety of missions” – despite, they add, “the original challenging mission requirement operational restrictions required for operation from small-deck aircraft carriers”. “Stoof” students: grab this superb study. Then line up behind me for Ginter’s next installment!